Synopsis: In his youth, Simeon Lee traveled the world and made his fortune mining diamonds but was cruel to his wife and alienated all but one of his sons. Now elderly, widowed and an invalid, Lee invites his sons and long-lost granddaughter to his home for Christmas. But, instead of inviting them to make amends, he uses the opportunity to once again show his cruel side by hinting at changes to his will and pitting them against each other. When he is brutally murdered later that same evening, detective Hercule Poirot is called in to assist. Was the murder related to a bag of uncut diamonds Lee reported stolen? Did a member of his family finally snap? Or, was it Stephen Farr, the son of his former business partner who happened to show up at the house unexpected? Review: I was a bit hesitant to check this book out from our local library because, at first glance, I thought it was going to be a Christmas-themed book and it is only July. However, I'm trying to read the Hercule Poirot novels in order and this was the next one on the list so I wound up reading it anyway. And, as it turns out, it was a good choice. First of all, despite the title, the fact the murder happened to take place around Christmas was pretty much the only thing holiday-related. That, in itself, was kind of minor and it did wind up being a typical murder mystery otherwise. It also ended up being an entertaining mystery. I've read enough Christie novels to know to consider everyone (with the exception of maybe Poirot) a potential suspect (this includes the narrator, if there is one). And, because of that, I was able to correctly figure out who the killer was. But, even then, I wasn't completely sure of that person's motives or how, exactly, they pulled it off. Adding to the mystery is the fact there were two strangers in the house, Stephen Farr and Lee's granddaughter, Pilar. Both of them seemed to be hiding something and, while part of me thought it was going to be something completely unrelated to the crime (another common theme in her books), I couldn't completely rule either of them out. Of the two, Pilar was the one I was most intrigued by. Yes, she had nothing, apparent at least, to gain by her grandfather's death. But, as I've seen in plenty of Christie's novels, that really means nothing and it is often the person with no apparent motive who turns out to be the killer. Also, since she was the last person to see Lee's uncut diamonds before they were reported stolen, that did make her a suspect with that, though whether the murder and theft were related was still unclear. This kept her as a dark horse suspect even when it looked like she had been cleared and kept the book interesting as a result. 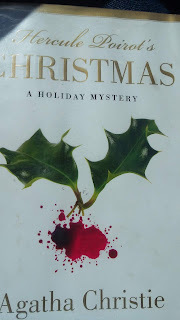 Final Opinion: This was an interesting murder mystery that I enjoyed reading, even though it is July. I would recommend taking the time to read it if you get a chance.